Focus groups, questionnaires, surveys, polls, public relations and data mining have been made into a science by marketers of products and services. Governments and politicians have not been far behind with incorporating these same tools to make their messages resonate with their target audience. This of course neglects the fact that making statistical assumptions and extrapolations based on small or compromised data sets adds the risk of skewed results. The damage could be compounded if these results were used for decisions affecting the whole country. The Aussie government has taken this approach of “governing by poll data” even to the realm of national security by incorporating polls, focus groups and active public relations (isn’t this the same as propaganda?) in their war on terrorism. 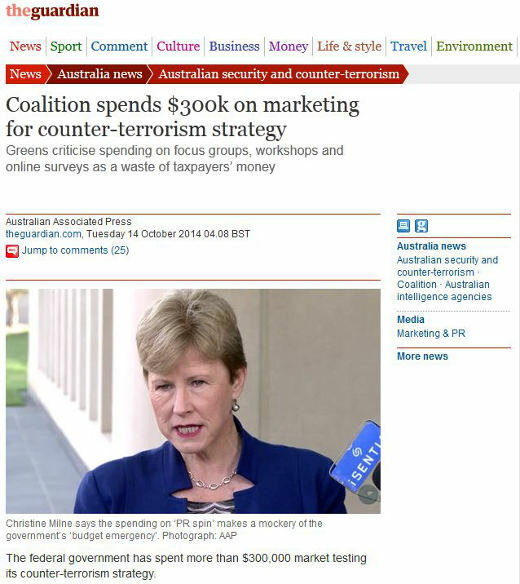 The attorney general’s department spent more than $201,000 on interviews, workshops and online surveys to assess the “effectiveness of key messages” and “barriers to messages” about supporting and participating in overseas conflicts. The research was conducted in the past financial year “to inform national approaches” to communications, a department spokesman said on Tuesday. Is this better than making a unilateral decision on terrorism or any other national matters? Is this true representative democracy? Or is this just doing what’s often done with the help of statistics? Dirani said his parents bought the plastic sword at a night market in Sydney. It has been on display in the family home for years. Hard to second guess what a policeman or woman conducting this massive operation may have been thinking – probably that they’d rather be too careful than not and cover their rear. A bit more from the article. 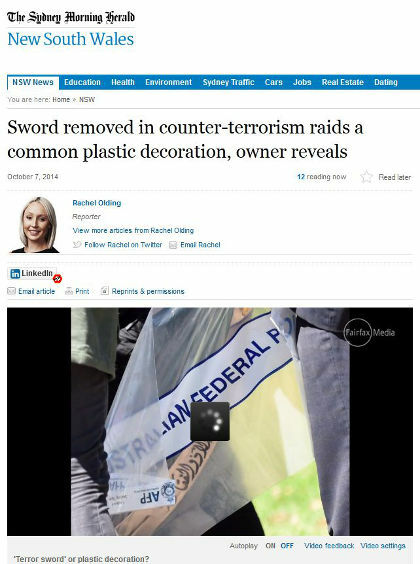 Jamal Daoud, a prominent member of Sydney’s Shiite community, said the sword would be found in almost every Shiite household as a decorative item either hanging on the wall or sitting in a drawer. Sheikh Zaid Alsalami, leader of the Nabi Akram Islamic Centre in Granville, said many Shiite Muslims would also wear the sword as a pendant similar to Christians wearing a crucifix necklace. Should fans of Lord of the Rings who may have a replica Morgul Blade be concerned? Or maybe those who collect Samurai swords? What about a devout Sikh carrying a kirpan? Swiss Army Knife ok?